Persimmons have always been one of my favourite fruit and at the moment I am seeing these beautiful small astringent types which are soft, juicy and look like they are ready to burst open over here in Vietnam. They are elongated in shape with a tapered point. 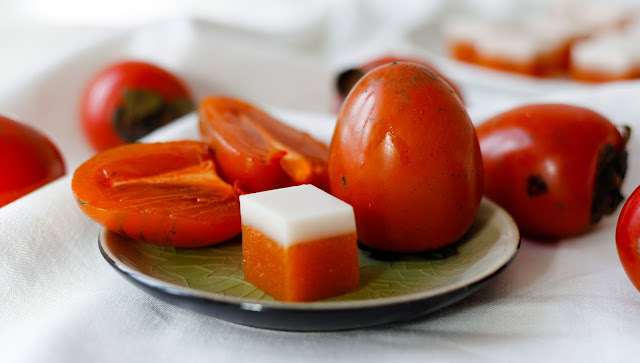 You need to wait until they are super soft to eat them unlike the non astringent variety which is eaten crunchy, firm and rounder in appearance like a beef tomato. I was over enthusiastic at the market and bought a few too many and wanted to use them up and made these persimmon and cream gummy lollies. Oh boy! these turned out so good!! I’ve only seen the bigger version of the soft astringent types, these little ones are super gorgeous and the perfect snack size to slurp up in one go. To eat them as they are, I just break them in half and slurp up the delicious soft flesh discarding the skin, my favourite part is the crunchy jelly like segments and bits surrounding the seed. They are in season from about February to June in Australia, Fall in the USA, November to February in the UK. Baby persimmons ready to burst in your mouth! 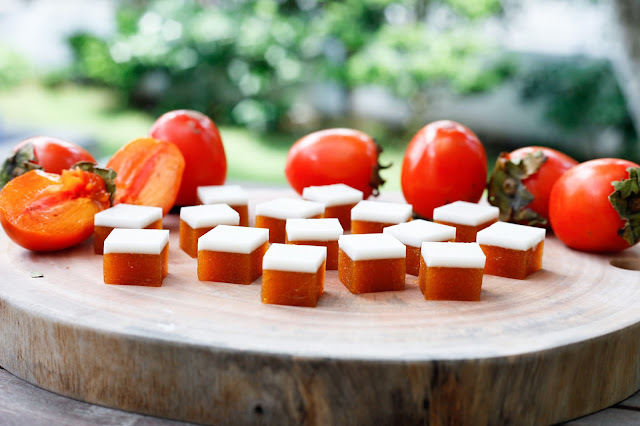 These Persimmon and Cream Gummy Lollies are only sweetened with honey and made with all the fruit pulp. They make a nutritious snack with the goodness of grass fed gelatin (I use Great Lakes (you can buy on iherb or amazon)which is known for it’s ability to help heal the gut, supports hair, nail and skin growth, assists with joint care and is a source of protein. You can pack them in lunch boxes (with an ice pack) and make a healthier treat for birthday parties etc. Hope you enjoy! if you make these please share them with me! These are so pretty! I love the layer, such a great idea. I’ve never thought about layering flavors. I bet this combo is yummy. 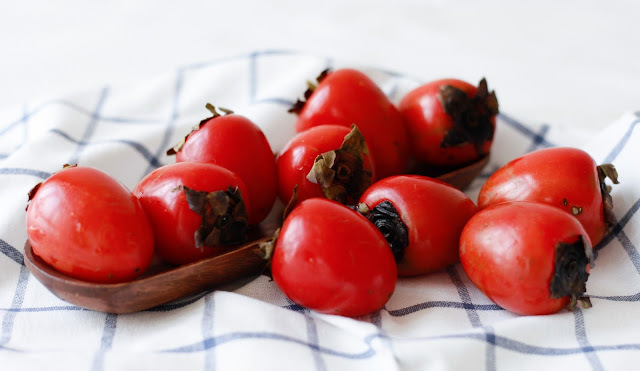 When I look at the persimmons, they remind me of Hawthorne berries. Love the layering as well. Wow! What an exquisite looking snack: healthy and delicious! Just need to get my hands on some persimmons! I’m doing the I Love This Recipe Dance! 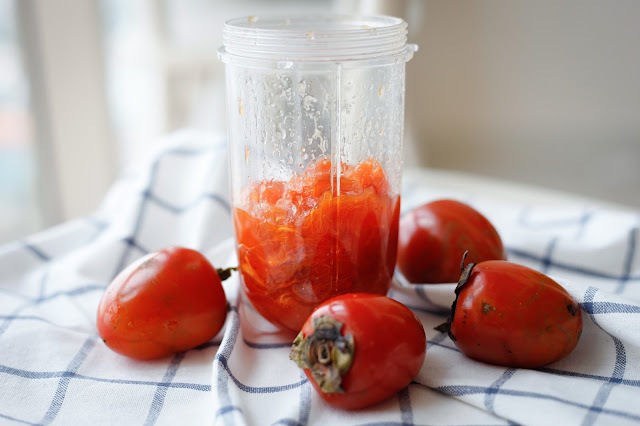 We just enjoyed our first November persimmons today! I’d love to now make this for my kids!! Thanks, May! Wow, these look so good! 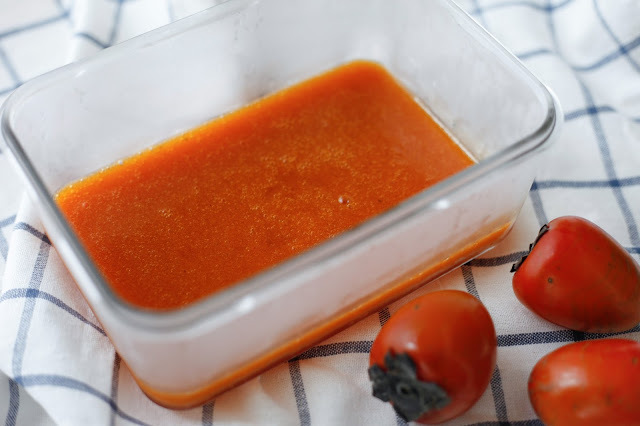 I have never tried persimmons before, think this would be a good recipe to try for the first time? Thanks Rachel! ohh I think you should definitely try them on their own too, and make sure you get the astringent type that needs to be really soft and gooey before you eat it and I hope you like these also! Such a pretty treat, lovely color too! 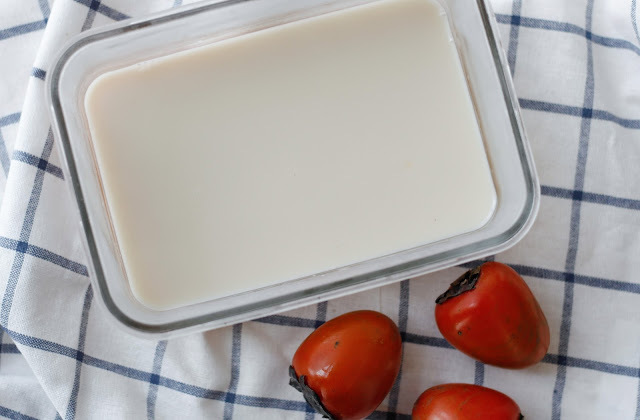 Love this recipe and I’m making it now! It looks pretty and soooo yummy! Thanks em and will let you know later. 🙂 So excited! 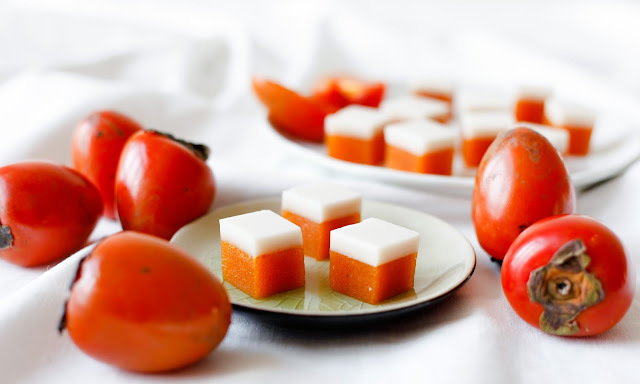 I had my persimmon jello photo in your FB’s page!